JOHNATHAN Thurston has made a habit of nailing clutch conversions. Just ask the Blues. But on Saturday night, the Cowboys halfback proved he is human as he missed a sideline conversion from his preferred left edge that would have levelled the scores against Cronulla with seven minutes remaining. 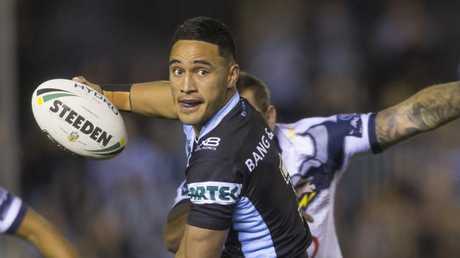 Instead of sending the Steeden through uprights, he pushed the shot wide and the Sharks raced in two late tries to win 28-16 and stay within reach of top spot. Thurston had earlier set up a Coen Hess try with a magical flick pass but was otherwise well contained in what his final game in Sydney. The loss keeps the Cowboys rooted to the bottom of the table ahead of next week's 'Spoon Bowl' against the Eels in what will double as his Townsville farewell. A huge contingent of fans stayed back at Southern Cross Group Stadium to say farewell to the retiring legend, and Sharks skipper Paul Gallen has no doubts Thurston will one day earn Immortal status. "He's a legend of the game, without a doubt," Gallen said following an emotional post-game exchange with his long-time rival. "I'm writing a book at the moment with my top five players of all time and he's in it. "As much rivalry as we've had and words on the field that we had, every time we've toured together and played for Australia, we've always been good mates and I've got enormous respect for him." 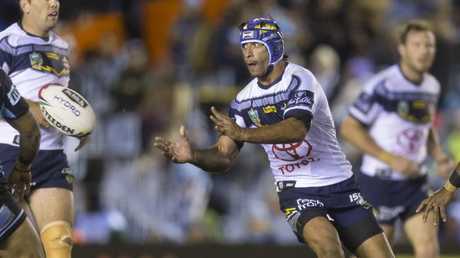 Thurston's farewell almost overshadowed Cronulla's gritty win which has them well placed to push for a top-four finish. 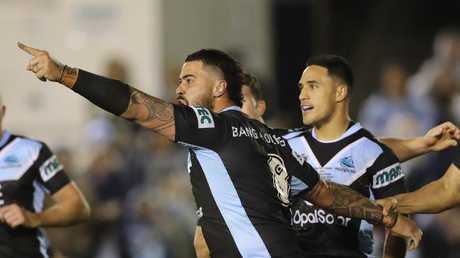 The see-sawing affair needed a hero and Sharks enforcer Andrew Fifita reproduced his 2016 Grand Final heroics to crash over when it mattered most to give his side the lead. Rather than celebrating, Fifita pointed towards the coaches box in frustration. It wasn't clear what the gesture meant, but the Tonga star later revealed to Fox Sports that it was intended for Jim Dymock after the assistant coach had challenged him to run harder earlier in the week. The prop had endured a lengthy stretch on the bench but showed in his second stint why he is regarded as one of the best big men in the game. The challenge now for the Cronulla coaching staff is to harness that passion heading into the finals. "When he came on, he made a big difference. 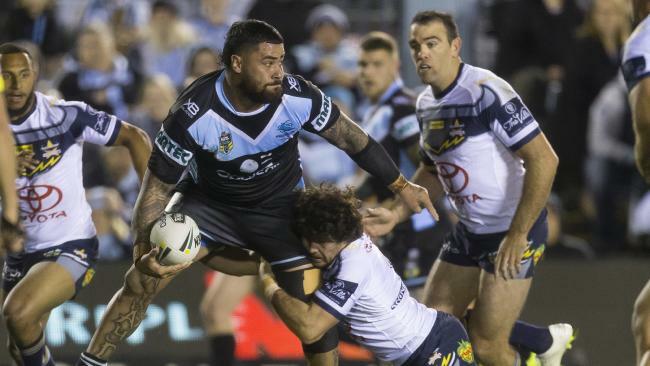 We need Andrew Fifita going at his best to win big games at the end of the year so I was pretty happy with the way he played at the end," Sharks coach Shane Flanagan said. "Jimmy is one of those blokes - they're both Tongan and have got bad tempers. Jimmy told him he wasn't running hard enough and he ran hard enough and got a try in the second half. I love the passion from both of them. I'll be getting Jimmy to tell him that again next week."